Three new crew members arrived at the International Space Station on Wednesday after an express ride aboard a Russian Soyuz capsule. 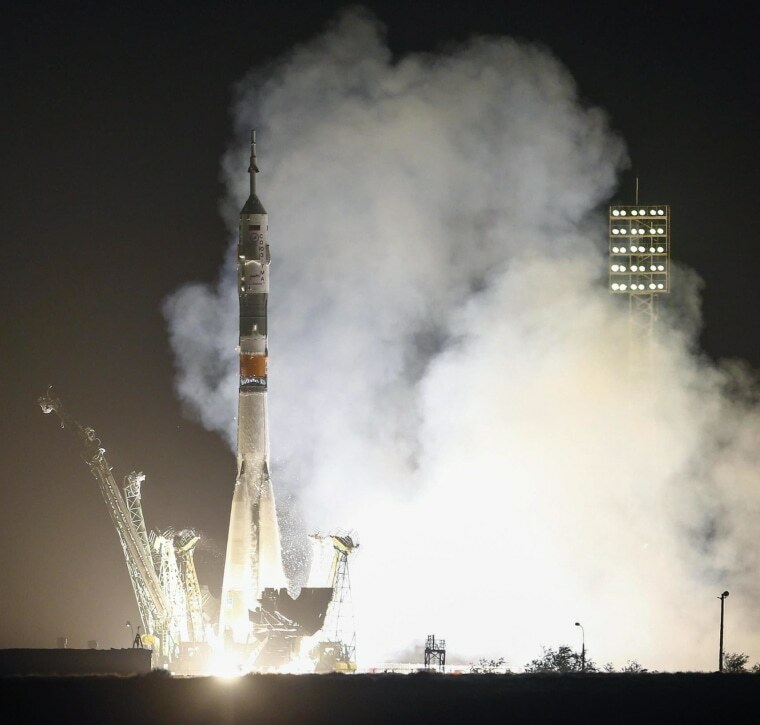 NASA astronaut Reid Wiseman, German astronaut Alexander Gerst and Russian cosmonaut Maxim Suraev soared into orbit from the Baikonur Cosmodrome in the Central Asian nation of Kazakhstan atop a Soyuz rocket at 3:57 p.m. ET (1:57 a.m. Thursday, Moscow time). About five minutes into the flight, the crewmates exchanged high fives and gave thumbs-up signals at the onboard camera. A toy giraffe was hanging inside the capsule to help show when the crew entered microgravity. Wiseman's young daughters gave him the giraffe for good luck on the mission. The Soyuz craft took advantage of a series of "fast-track" maneuvers that reduced what used to be a two-day trip to less than six hours. The capsule docked with the station at 9:43 p.m. ET Wednesday. This is the first space mission for Wiseman and Gerst, while Suraev has been to the space station before during a mission in 2009 and 2010. NASA's Wiseman said he plans to share his space experiences with people on Earth via social media. "First I've got to learn how to live and work in space, and after that, I have to be a really good worker bee for NASA and for our European and international partners, because that's my job from 9 to 5 is getting the work done, getting the science done," Wiseman told Space.com in a video interview before launch. "Then free time that comes beyond that, I want to share this experience, primarily using Twitter." The trio is joining NASA's Steve Swanson and Russian cosmonauts Alexander Skvortsov and Oleg Artemyev on the orbiting outpost. You can follow Wiseman (@astro_reid) as well as Suraev (@Msuraev) and Gerst (@Astro_Alex) on Twitter. This is an updated and condensed version of a report from Space.com. Read the full report. Follow Miriam Kramer on Twitter and Google+. Follow Space.com on Twitter, Facebook and Google+.